The Washington Center for the Book has announced the finalists for the 2015 Washington State Book Awards, prizes given in seven categories for books published in 2014 by Washington state authors. The center for the book, headquartered in the Seattle Public Library, chose these books as finalists for each of the prizes. To be eligible, an author must have been born in Washington State or is a current resident and has maintained residence here for at least three years. “Steal the North” (Viking/Penguin) by Heather Brittain Bergstrom (Viking/Penguin). Bergstrom is a Washington State native who lives in Yuba City, Calif.
“A Man Came Out of a Door in the Mountain” (Penguin Books) by Port Townsend resident Adrianne Harun. “The Hour of Lead” (Counterpoint) by Bruce Holbert of Nine Mile Falls, Wash.
“The Iron Sickle” (Soho Press) by Martin Limón of Lynnwood. “The Dismal Science” (Tin House Books) by Seattle resident Peter Mountford. “Hourglass Museum” (White Pine Press) by Kelli Russell Agodon of Kingston. “In Orbit” (Blue Begonia Press) by the late Kim-An Lieberman of Seattle. “Bugle” (Canarium Books) by Spokane resident Tod Marshall. “The Mountain Poems of Stonehouse” (Copper Canyon Press) by Red Pine, of Port Townsend. “Badluck Way: A Year on the Ragged Edge of the West” (Atria) by Bryce Andrews, Washington State native, current Missoula resident. “Loitering: New and Collected Essays” (Tin House Books) by Charles D’Ambrosio, Washington State native, Iowa City resident. “Burnt Toast Makes You Sing Good: A Memoir of Food and Love from an American Midwest Family” (Viking) by Kathleen Flinn, of Seattle. 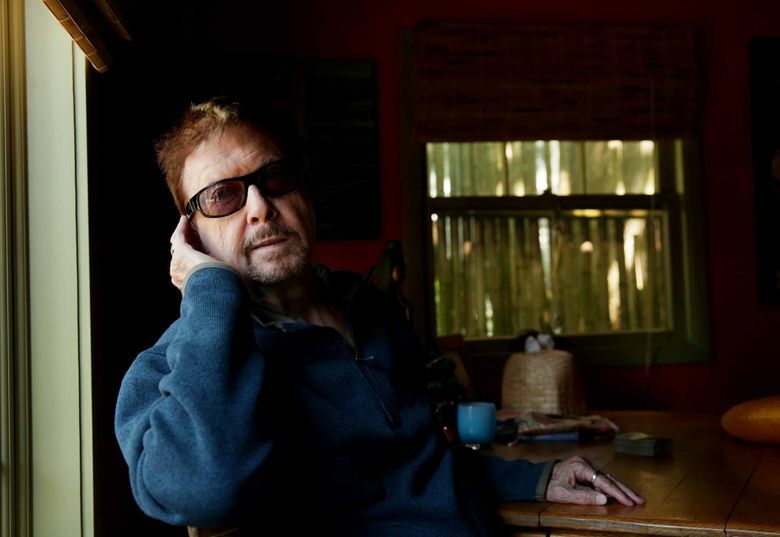 “Tibetan Peach Pie: A True Account of an Imaginative Life” (Ecco) by Tom Robbins of La Conner. “My Body Is a Book of Rules” (Red Hen Press) by Elissa Washuta of Edmonds. “In Season: Culinary Adventures of a Pacific Northwest Chef” (Sasquatch) by Bainbridge Island resident Greg Atkinson. “The North Cascades: Finding Beauty and Renewal in the Wild Nearby” (Braided River) by William Dietrich of Anacortes. “When Money Grew on Trees: A.B. Hammond and the Age of the Timber Baron” (University of Oklahoma Press) by Spokane resident Greg Gordon of Spokane. “Mary Randlett Portraits” (University of Washington Press) by Frances McCue of Seattle. “Trying Home: The Rise and Fall of an Anarchist Utopia on Puget Sound” (Oregon State University Press) by Tacoma resident Justin Wadland of Tacoma. “Little Green Peas: A Big Book of Color” (Beach Lane Books) written and illustrated by Keith Baker of Seattle. “Two Speckled Eggs” (Candlewick Press) written and illustrated by Bainbridge Island resident Jennifer K. Mann of Bainbridge Island. “Hands Say Love” (Little Brown Books for Young Readers by George Shannon of Bainbridge Island, illustrated by Taeeun Yoo. “S Is for Salmon: A Pacific Northwest Alphabet” (Sasquatch) written and illustrated by Hannah Viano of Seattle. “Phoebe and Her Unicorn” (Andrews McMeel Publishing) by Dana Simpson of Des Moines, Wash.
“Ken Jennings’ Junior Genius Guides: Maps and Geography” by Ken Jennings of Seattle (Little Simon). “Time Out of Time: Book One: Beyond the Door” by Maureen McQuerry, of Richland (Amulet Books). “Pure Grit: How American World War II Nurses Survived Battle and Prison Camp in the Pacific” (Abrams Books for Young Readers) by Mary Cronk Farrell of Spokane. “Between Two Worlds” (Wendy Lamb Books) by Katherine Kirkpatrick of Seattle. “Six Feet Over It” (Random House Books for Young Readers) by Jennifer Longo of Seattle. “The Strange and Beautiful Sorrows of Ava Lavender” (Candlewick Press) by Seattle resident Leslye Walton.